Gameday vs Marlies Notes and Quotes · Let's Go Amerks! The long stretch away from home ice advantage is finally over and the Amerks are back in Rochester to play against the first place Toronto Marlies for Hometown Heroes night. So far this season the Marlies are 2-1 against the Amerks. The games are close. The game last week was 1-0 until the Marlies scored an empty goal with 30 seconds left. “It’s a big two points especially here at home. We always talk having a good start so we really need to focus on that,” CJ Smith said after practice. 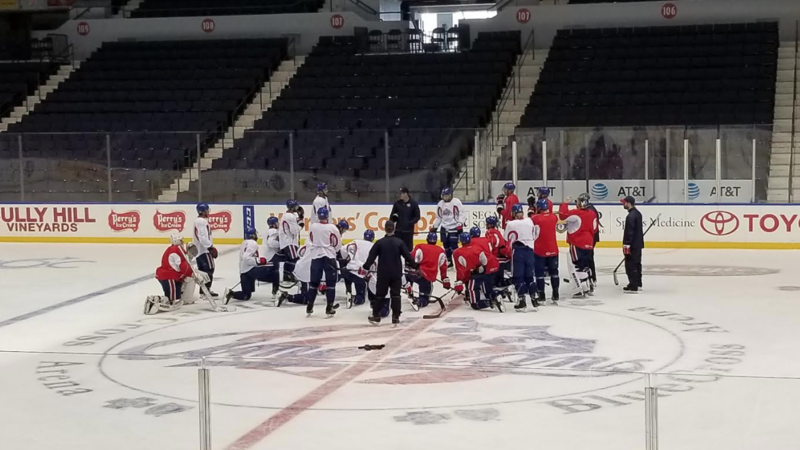 Unless you’ve been unplugged from the internet for the last week you’ll know the big story line tonight is Brian Gionta suiting up for the Amerks for the first time in his professional career. He’s using this as a one game tune up before heading to the Olympics in South Korea. As he was talking it was natural for him to say “us chasing them.” Tonight will be his first game but he’s a part of this team as much as anyone else the locker room. Based on practices we can expect to see Gionta skating on a line along with Kevin Porter and Sahir Gill. Devante Stephens and Arvin Atwal were called up from Cincinnati this week and will be in the lineup paired up together. Nathan Paetsch and Conor Allen appear to be the scratches on defense. Looks like Dalton Smith will be the forward sitting out tonight. Could be Wilcox, could be Ullmark. We’ll have to wait until shortly after 6:30pm tonight to find out. Either way, this team plays with confidence in front of both goalies. In case you missed it, Linus Ullmark and CJ Smith had great performances at the 2018 AHL All-Star game helping lead the North Division to the win. CJ Smith skated away with the 2018 MVP honors with 3G+2A in the round robin three on three tournament. A crowd of over 7,000 pushing 10,000 is expected tonight so if you’re coming to the game buy tickets ahead of time to avoid long walk up lines. On busy nights there’s often a long line of cars to get into the Civic Center garage as well so if that’s your parking preference plan ahead!